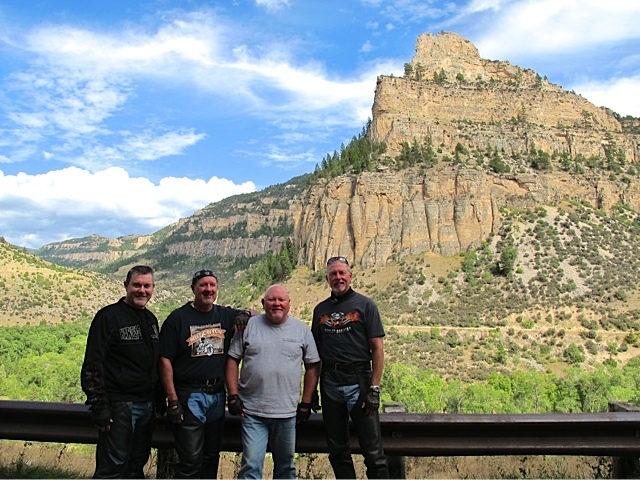 Five friends, 2200 miles, 15 fuel stops, and Ten Sleep Canyon – priceless! Sure it’s a nod to MasterCard, but priceless experiences are better when shared and now that I’m back from some extended work travel that is my intent. It was a sunny Saturday (August 24) and the leather-clad group rolled east like Pacific Northwest thunder to where more than 100,000 motorcycle enthusiasts were expected for the Harley-Davidson 110th Anniversary festivities in Milwaukee. The group had laid out a casual route plan, but embracing total spontaneity of the open road to see where ever the wind might take us wasn’t really in the cards for this trip. We did eat when we got hungry, slept when we got tired and would drink refreshments when the bikes were parked at a motel for the night. Three of us in this group had made a northern journey in 2008 for the 105th Anniversary (HERE), but on this trip we decided to take a more southern route. That meant a lot more freeway travel and covering some very familiar road for at least the first 500 miles. Boise, Idaho was like déjà vu all over again, (weren’t we just here?) and we must have been thinking about that Toby Keith song, “I Love This Bar & Grill” because we landed at the Reef restaurant again. We met a couple Canadian float plane pilots at one of the pub stops and shared some interesting stories. The next morning we departed Boise after a McD’s power breakfast and headed toward Jackson, WY. We initially planned to take Highway 20, through a desolate place known for the National Reactor Testing and then maybe a quick stop at Craters of the Moon National Monument. Climbing down a lava tube sounded like fun, but it was another incredibly hot day. Too hot to be walking around on black lava in motorcycle gear so we took the faster route and continued on I-84/I-15 to Idaho Falls. From there we rode out on Highway 26 to Swan Valley then rode on Highway 31 (Pine Creek Rd) through the Targhee National Forest into Victor, ID where we picked up Highway 33/22 (Teton Pass Hwy). 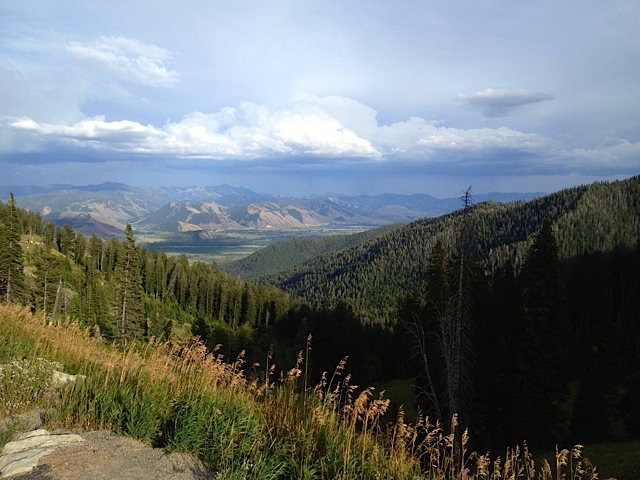 This road took us through the western end of the Teton Pass and southern part of Teton Valley. There were some great views! We overnighted in Jackson, WY., which has a cowboy theme about the place. Downtown has a daily gunfight and there are a lot of shops to spend $$ in if you like the tourist thing. We had dinner at the Rendezvous Bistro which had outstanding food and to die for Meatloaf! Strongly recommend the place if you’re in the area. 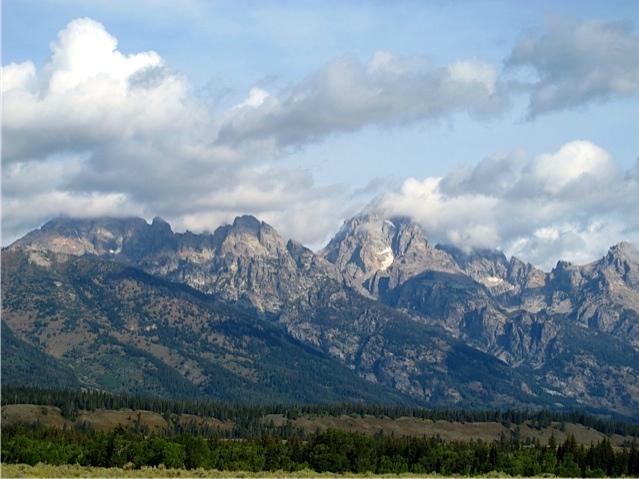 The next morning we headed out on Highway 191/89 and admired the majestic mountain view of the Grand Teton’s. The park gets over 4M visitors each year, but the traffic on this day was light. We stopped for a couple of photo ops, but continued on. We were leaving the “high-country” and at Morlan, we took Highway 26 east and rode toward Riverton then on to Thermopolis. There was a sign when we entered that said it was “the world’s largest hot spring” and is situated in a state park. We stopped for lunch at a local dive that was having issues with the grill vent. The entire place smelled like an open BBQ, but the burgers went down well. We continued on to Ten Sleep Canyon. Once a little known backwater, Ten Sleep is today a premier limestone climbing area in Wyoming. At Worland we rode out on Highway 16. It’s called “The Sweet 16” for being the easiest route to Yellowstone Park due to the gentle curves and lower grades. 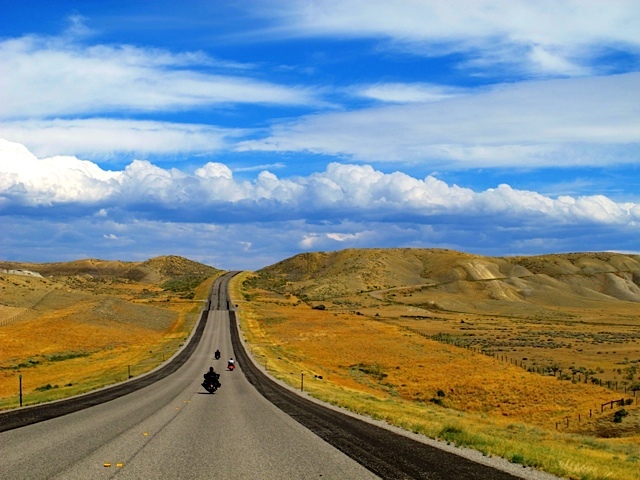 This 92 mile corridor is a great ride and should be added to your bucket list. From the town of Ten Sleep, US 16 leaves agricultural land and heads east along Ten Sleep Creek and through a spectacular canyon. The canyon is filled with vivid colored limestone and dolomite rock walls and the cliffs take on a life of their own with shapes and faces. 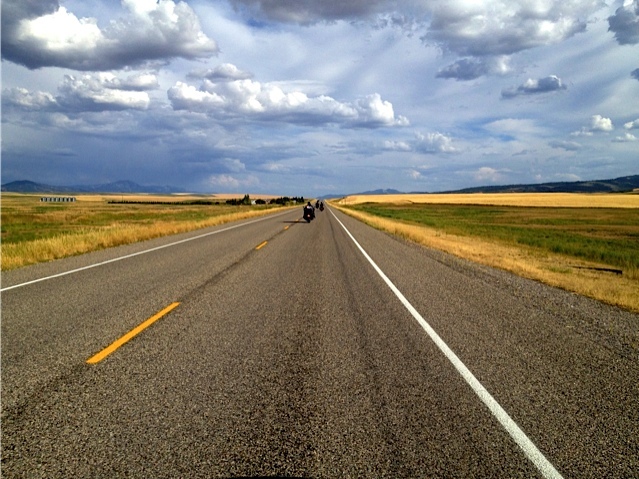 The road continues into the Big Horn Mountains, which offers up lush grasslands, alpine meadows and glacier lakes. The road crosses over the Powder River Pass at an elevation of 9,666 feet and then makes a steep descent (6-7%) into Buffalo. There we rode on I-90 east and overnighted in Gillette. This riding day was truly a highlight of the road trip in my view and one that is most memorable. It was filled with lots of mountain eye-candy, painted desert and Wyoming wonders. The 110th Anniversary Homecoming – Part 2 (HERE). Post Script: I neglected to include a shout out to MC who couldn’t make this trip. He and Sherry were excited to make the journey “home” and planned to ride out and join our group in Milwaukee. Unfortunately MC was hit by a driver (HERE) who was trying to beat a red light while attending Shark Week III in St. George, Utah in early August. We missed you MC and all of us are looking forward to future rides together! You can follow MC’s recovery progress HERE or on his blog HERE.